look away as if in an abattoir. A jackfruit can weigh as much as 80 lbs. It looks like durian, but experts say they are not closely related. 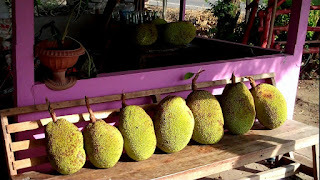 When I first came to Thailand I was amazed by the variety of weird Asian fruit I had never seen before. The jackfruit is one of the weirdest. I’ll probably never get hit by a meteorite or space junk, but the odds of getting hit by a jackfruit are a lot better. Chunky’s mother sells a jack fruit for $4 or so. I wonder if I could get a guy to fix the roof and pay him in jackfruit?